At the 2019 Devhub Vancouver, I gave a talk about how the nature of work is changing thanks to artificial intelligence technologies. The pattern is this: You find yourself in a world with robots. You realize that you must change something if you are to keep up with the pace of technological innovation. Do you fight the machine or do you embrace robots as your assistants? In my talk, I share my perspective on how people and humanity can leverage artificial intelligence and machine learning to work more efficiently. What happens when people begin to work side-by-side with robotic assistants? Watch my video talk below or continue reading for additional insights. We live in an intelligent world. We live in a world that is constantly evolving and we are now evolving with it. Technologies like artificial intelligence and machine learning are fundamentally changing how we work and live. Before diving into the details, it is important to recognize that AI is not a new technology. Artificial intelligence was first invented in 1950s and it has been around for more than 60 years! Machine learning took the spotlight in 1980s when computer scientists discovered that they can write software with the ability to automatically learn and improve from experience without being explicitly programmed. As more and more data started to accumulate around the world, a new contender was able to deal with the increasing amount of variety, velocity and volume of data called “deep learning”. This algorithmic approach is often referred to as “artificial neural networks”. Today there is a growing concern about whether there will be enough jobs for workers, given the potential of automation and artificial intelligence to take over jobs. History suggests that these fears are unfounded. 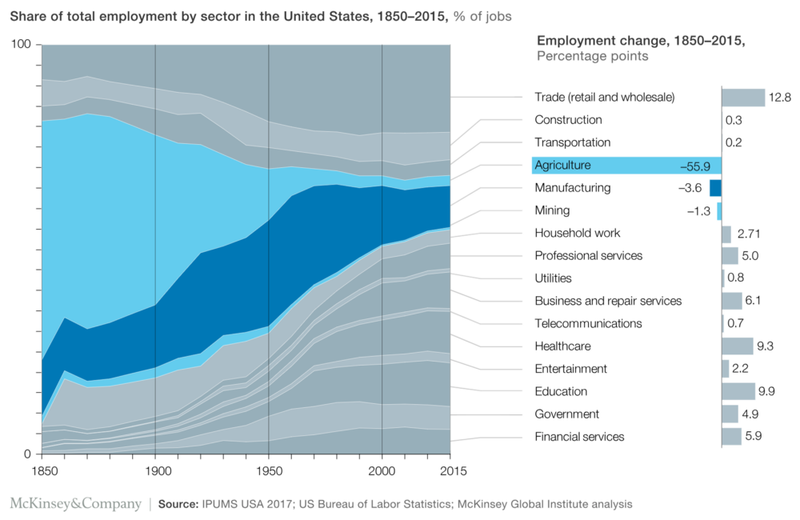 over time, labor markets adjust to changes in demand for workers from technological disruptions. Over time, more and more of these algorithms will look like machine learning code. While this presents many challenges, this also presents many interestings scenarios. The more we rely on code to run our lives, the more likely we are to delegate our data to feed a collective intelligence. Andrej Karpathy defined these concepts in 2017. Algorithms were once based on simple programming paradigms. Today, algorithms are driven by machine learning models. The world is transitioning from traditional programming (Software 1.0) to neural networks (Software 2.0). What is the difference between Software 1.0 and Software 2.0? 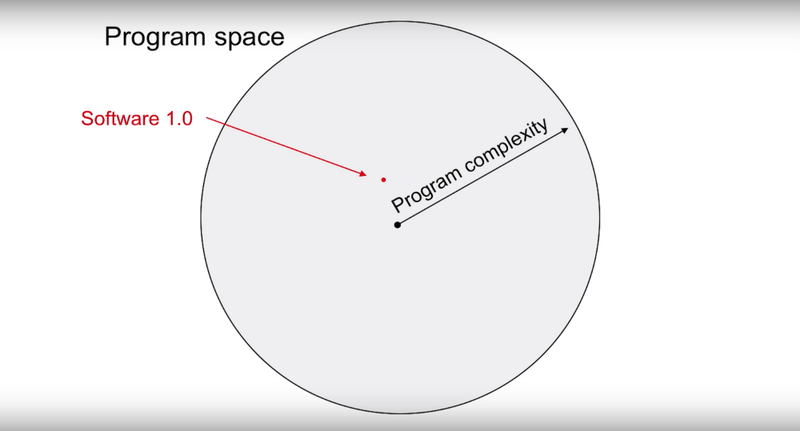 Software 1.0 is only able to handle non-complex tasks in a program space (see Fig 1). Software 2.0 is able to handle a more complex tasks in a program space (see Fig 2). 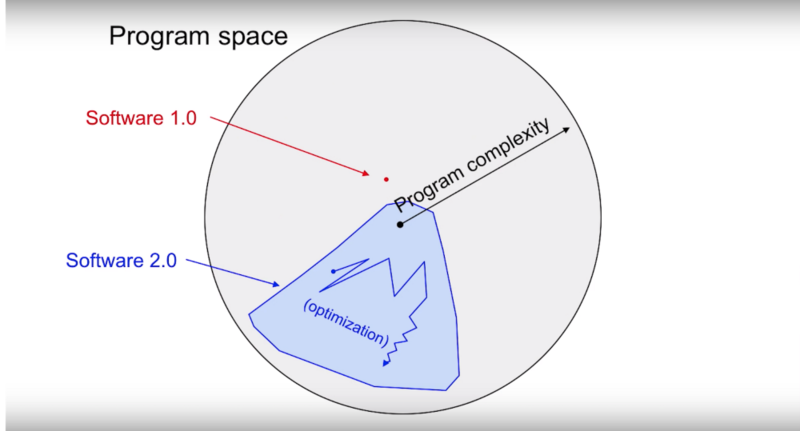 Software 2.0 is also able to optimize itself and solve for more complex problems (see Fig 3). In other words, the world is transitioning from simple software to intelligent software. 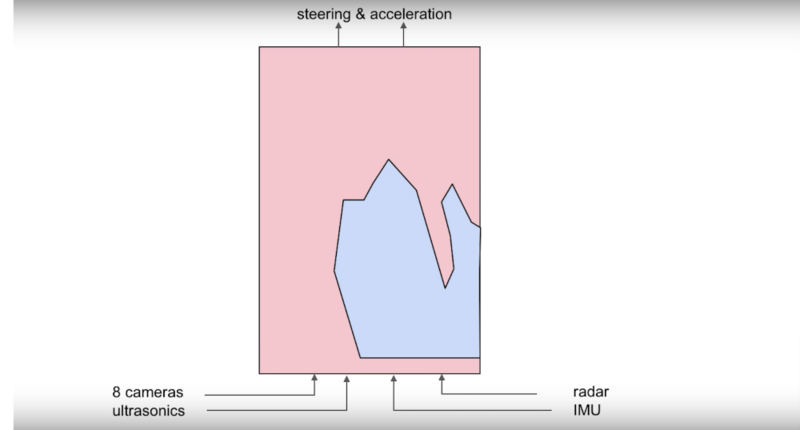 One of Tesla Motors goals is to achieve full autonomy, often referred to as Level 5 Autonomy. 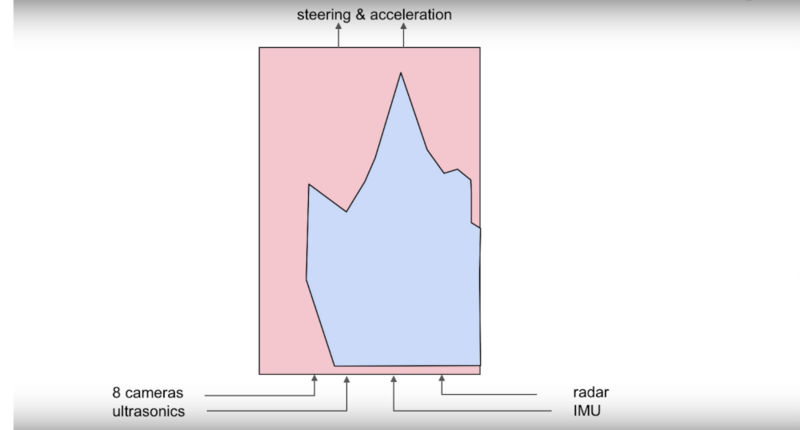 With this goal, the car must learn how to steer and accelerate given a variety of inputs (8 cameras, ultrasonics, radar, IMU). 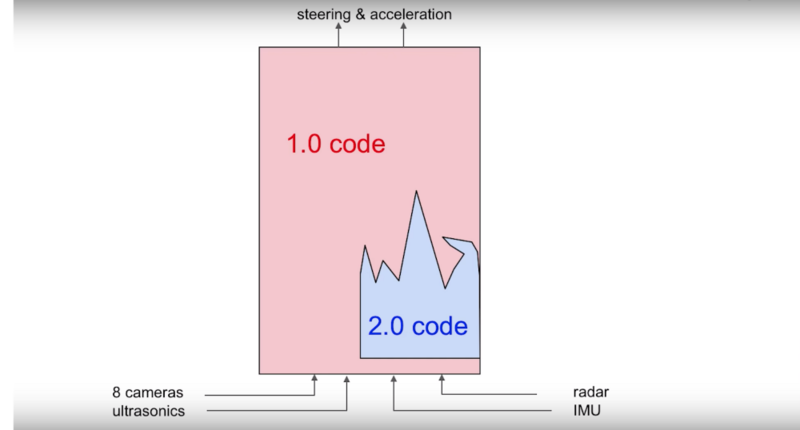 Tesla started with by deploying deep learning models to achieve basic autonomy, but they quickly realized that more of it’s code must be re-written in Software 2.0. Tesla began to transition to applying neural networks to more parts of its code. Since Tesla models are trying to understand the present and predict the future, today more code is now running probabilistic models instead of deterministic models. Software 2.0 is based on the premise that a large portion of real-world problems have the property that it is significantly easier to collect the data (or more generally, identify a desirable behavior) than to explicitly write the program. Software 2.0 is about optimization. Here is now how the software stack changed at Tesla. In other words, Tesla’s technology stack is driven more by neural networks and less driven by traditional programming. I predict that over time, more of the world’s algorithms will be powered by intelligent software, driven by machine learning and neural networks. Advanced Chess created a new era: AI-human hybrid intelligence. For the first time, humans didn’t have to fight machines. Humans now could collaborate with machines to win chess games. Working with a cognitive machine became dialog, a symbiotic relationship. Human plus machine isn’t the future. It’s the present. Is it possible to combine the strengths of people with machines? Let’s break this down. Humans can combine intuition with machine’s calculation. We can leverage strategy with machine tactic. We can use our experience and combine it with machine memory. Machines have calculations, we have understanding. Machines have instructions, we have purpose. Machines have objectivity, we have passion. Our workflows, tasks and jobs are being automated by computers. These technologies at first are there to augment us. Intelligent agents will help you in your work. You will perform less tedious, less monotonous, less dangerous tasks in the future. AI, robots and automation will take care of this for you so you can focus on other tasks. Humans will be creating data and AI will be making sense of such data. This trend will continue. We will learn how to deal with more Velocity, Volume, Value, Variety, and Veracity of data. We use virtual agents to become better, faster, stronger, more resourceful, more creative that we are today.